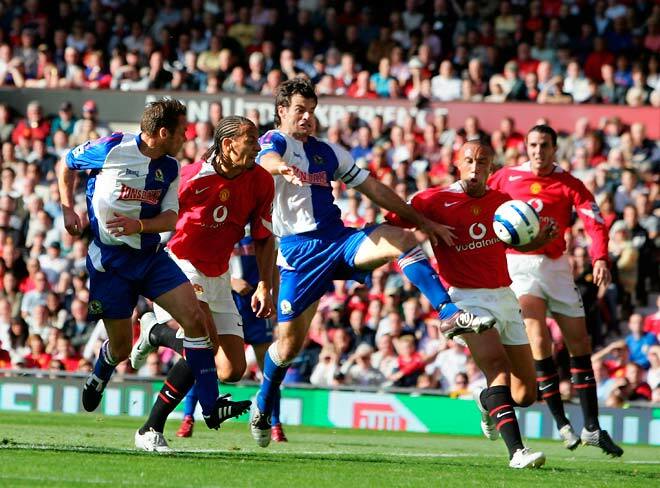 Ryan Nelsen, centre, plays as defender in Blackburn Rovers' game against Manchester United at Old Trafford on 24 September 2005. In front of a crowd of 67,765, Blackburn won 2–1. Nelsen entered professional football in the United States and then became the third New Zealander to play in England's premier league. In this image Nelsen is flanked by Manchester United players Rio Ferdinand (left) and Mikael Silvestre. Nelsen captained the All Whites in the 2010 World Cup and also Blackburn Rovers. He subsequently joined Tottenham Hotspur and Queen's Park Rangers before becoming, in 2013, the head coach of the Toronto Football Club in North America's Major League Soccer competition. Photograph use authorised by kind permission of the Premier League in England.